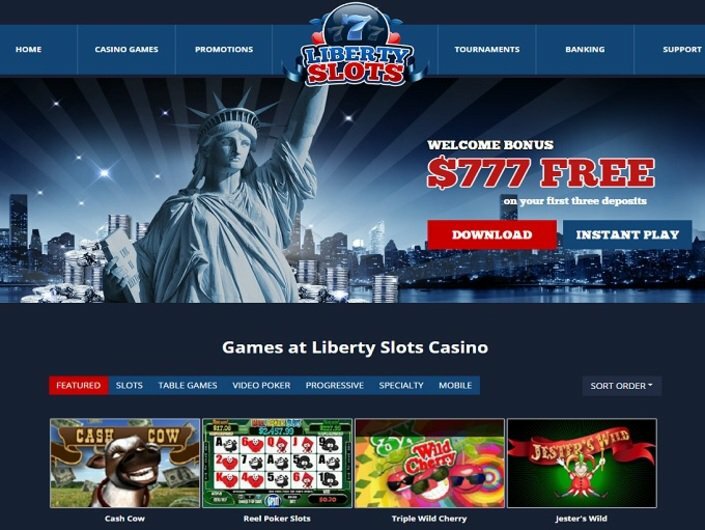 Liberty Slots is a popular online casino operator which came online in 2011. They have a big number of satisfied players and they are regulated in the jurisdiction of Curacao. The casino is powered by WGS Technology and can be accessed in download, instant play and mobile mode. The casino games at Liberty Slots are proven to be fair by Jacobson Gaming and players must be over 21 in order to play legally at the casino. This is one of the rare operators which still accept players coming from the US. When playing at the casino you can only use US dollars. For making deposits at Liberty Slots you can choose to use a variety of payment methods like Neteller, Skrill, Paysafe Card, Credit and Debit Cards, Ukash, Transfer Money, Sofort, Quick Cash and Eco Card. For withdrawals you can use Bank Wire Transfer, Cheque, Debit Card, ECO Card, Neteller and Skrill. The maximum you can withdraw from Liberty Slots within a 7 days period is set at $5,000. All withdrawals at Liberty Slots have a mandatory pending period of 24 hours. After that payouts to e-wallets are processed within 24 to 48 hours, while payments to other payment providers can take anywhere from 2 to 14 days to be processed. New players at Liberty Slots casino can claim up to $777 free bonus money on their first 3 deposits at the casino. This is a 100% match deposit bonus up to $259, which you can claim for a minimum deposit of only $5. If you’re a low roller this is the perfect opportunity to try the casino games for a minimum deposit. If you like playing on higher bets chasing for that big win you should take advantage of the maximum bonus amount. After you use up the welcome bonus at Liberty Slots you can expect many more promos on your player account. The casino has a weekly bonus in play, as well as a VIP rewards system. The more you play at Liberty Slots the higher you climb up the VIP ladder and unlock some great prizes.